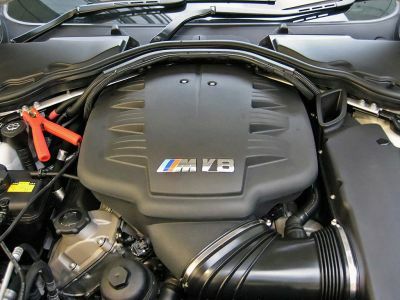 Attention BMW Owners with a Car 2002 and Later with the 4.4L V8 Engine | Atlantic Autowerks Ltd.
One major problem we have seen is where one or both camshafts are jumped out of time in the driver's bank of the engine (Bank 2 or cylinders 5-8), which is the last place the oil goes. When the timing jumps like that, the timing chain is rapidly jumping up and down and causing unnecessary wear-and-tear. Alternately, the movement can break the timing chain tensioner guide rail. Usually, the guide rail plastic guide is broken off and slides down into the lower timing cover. The only way to fix the problem is to tear down the entire front and top part of the engine and replace the timing chains, guides, and tensioners; reset all cams; and replace all gaskets/seals--a job that could cost as much as $10,000. This motor does not come with an oil level dip stick; instead BMW has incorporated an oil level sensor gauge in the instrument cluster. Please keep an eye out for this gauge every time you start the motor. This motor has been known to be quite the oil-leaker too! Most of the oil issues come from a hard seal on the left part of the block between the alternator mounting bracket and the engine block, as well as from the valve covers on both sides and the vacuum pump on the front of Bank 1 (passenger side) of the engine. If you have any of the seals leaking, get them fixed ASAP or at the very least, make sure the crankcase is full of oil every time you drive the car. To schedule an appointment for repair in the Virginia Beach area, please give us a call at 757-466-1269.